This is an album of various sounds I've made/synthesized/found/partook in between around 1999 and 2018. I guess you could call them demos. Some of it is vaguely telephony/computers/compression related but then there's also a transportation section and the rest is just random noodling. 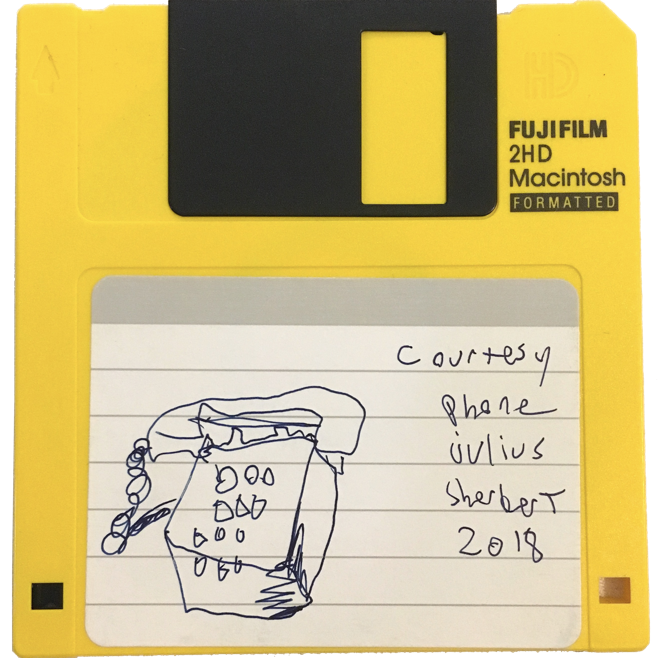 I released it in a limited run of 20 floppy disks at the South End Art Hop in Burlington Vermont, September 7th, 2018. There are still a few available, send me an email if you'd like to buy one ($10 incl shipping). The icon on the floppy disk is one of a series of floppy disk icons I did when I was a kid (I think I kind of loved floppy disks?). The album is free to download. Maybe eventually I'll allow streaming from the web but for now it's just 100mb zip (the mp3s on the floppy are highly compressed). Three, it's kind of a commentary on how it doesn't really matter what the physical medium we buy music on these days. Yes vinyl sounds great, yes people sometimes play tapes in their car. But mostly, even if I buy a record, I'm just going to listen to it on my computer/phone anyway. But I am aware of this. I'm buying the record to support the artist, to show that I like it. Anyway, four, it's interesting that the whole thing can fit in 1.4mbs. Five, also interesting is the compression on the audio is so high on the floppy, it contributes to one of the themes of the album: digital distortion and compression beyond comprehension. Six, it's interesting to me to see who actually will listen to the floppy copies! Like a digital treasure hunt haha. my mom who exposed me to computers at an early age and put up with and encouraged my strange creations. this is an excerpt from a 20 minute film called Dial Comes to Town about the switch from a phone system where one would lift the receiver to talk to an operator (and no numbers on the phone itself) to rotary dials and the introduction of the dialtone. aha! You want to hear a peaceful dialtone! But no! In the digital age we just get crazy digital distortion like this one I recorded. this is the first 40 seconds of a 2 minute voicemail I received. To me it sounds like this band Maui (later known as Grass Mansion). Heavy. a voicemail that sounds kinda like a dirt bike haha. this is a recording of me interacting with an automated phone service thing. The reason it was so distorted I think was because, I didn't realize it at the time, but I had a setting set in Talkatone (the ios app I was using for telephony at the time) that over-boosted and distorted the audio. I think I lived with this for.... years? lol. a recording from a teleconference. this is a track I recorded at UVMtv in 2009 with my friends David Boyd and Conor McArdle. The full session is available here. Dave and Conor's voice is pretty funny to me without the visual context. The next 3 tracks serve as a bit of a triptych (tracktych heheheh). First one represents Tesla, second one is the combination of Tesla and my solar car, and third one is jokingly the solar car. I own a share of Tesla so I attended the shareholders meeting in 2016. Elon was taking questions at the end. I knew that solar cars aren't really mass market. For the few people they do work for they work really really well. But Tesla's not going to chase such a niche market. But I asked it anyway just to say I asked Elon Musk a question. The video was later uploaded to the Teslas investors site. Driving my truck around San Francisco I realized that when I listened to the AM radio the speakers would squeal when I hit the accelerator. This realization happened around the same time I heard a program on the radio about the Tesla Model S. So I recorded it. It's interesting to me because the juxtaposition between the janky truck and the the description of a very modern, impressive car. And when they say "like in a 1980s sci fi movie" and then my AM radio squeals like that. Eventually it just kind of turns into aleatoric AM radio scanning. A remix I did in 2004 of Chuck Berry's Riding Along in my Automobile. I renamed it death-mobile I think because being a junior in highschool that sounds funny. Also for the lines about no safety belts. In my mind it fits into the triptych as my truck could be looked at as a deathmobile, not because there are no seatbelts but because it's not rated for highspeed crashes (no airbags). Though I never really feel unsafe in my car. I can't go on really fast roads anyway. a sound I recorded in 1999. I used to record a lot of sounds. A microkorg jam from 2010. This song has been on my website for a while and was included on the Wedge Comp 2 (Leopard Shepherd Records). from a collection of recordings I shared with Lindsay as inspiration for Plasmaarc Wasted. an insane remix I did of Van Dyke Parks' Jack Palance. a field recording of a coffee machine I did in 2010? Played some synthesizer over a recording of a lecture by Allen Alda at Stanford someone sent me. I sent this track to my friend Hannah Burgos in Mendocino, so. I should do a better version of this.